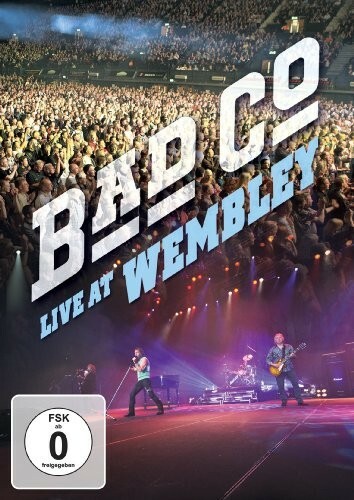 The original version of Bad Company are back again - founder members Paul Rodgers, Mick Ralphs and Simon Kirke, augmented by Heart guitarist Howard Leeseandbassist Lynn Sorensen, are captured live at Wembley, when they played there supported by the Joe Perry Project. This DVD set features the quintet blasting through what is probably the closest you can get to a definitive Bad Company set list. Most bands save their biggest songs for later in the set, but Bad Company don't, kicking off with 'Can't Get Enough'. Swiftly followed by 'Honey Child', it's one quality song after another with 'Run With The Pack', 'Feel Like Making Love', 'Shooting Star', 'Rock And Roll Fantasy', Moving On' and of course the song 'Bad Company' itself, all aired in front of an enthusiastic packed crowd. Also included are renditions of 'Young Blood' and the seldom played 'Electric Land', as well as Boz Burrell's 'Gone Gone Gone' and the more laid back 'Simple Man'. Watching this, it's basically the Paul Rodgers show. After his two huge tours with Queen, Paul seems invigorated and more confident than he has for years, and his influential voice is in top form. He takes centre stage for an excellent acoustic rendition of 'Seagull' and can been seen at the piano hammering out some of the trademark chords. Ralphs and Kirke blend into the background along with hired hands Sorensen and Leese - in fact, I felt Howard Leese would have been quite happy handling the guitar duties by himself. As far as the set list goes, it's pretty faultless. As far as performance goes, it's pretty faultless. The sound is superb, it's filmed beautifully and looks the business. The only thing that stops me being 100% sold on it is it came so swiftly after their 'Hard Rock Live' release - a show which had a very similar setlist, and personally, I thought the 'Hard Rock Live' gig had more energy about it. Maybe it's the large stage at Wembley, because only Paul does any sort of moving around, but to my ears, the performance on the 'Hard Rock Live' show is just that bit more uptempo. The only time I feel Bad Company hit their 'Hard Rock Live' stride on this show is on the closing two songs, 'Bad Company' and 'Deal With The Preacher'. That minor criticism aside, I really see no reason why a Bad Company fan wouldn't want this. Setlist wise there's precious little you would want adding, with the possibly exception of 'Rock Steady' (but that's on the 'Hard Rock Live' show) from this era, and they prove they've still got it. There's interviews with the band added as extras. You can get the show on CD, which only omits 'Burning Sky' and is seamlessly edited to get onto a single disc. 'Live At Wembley' has all the quality you'd expect and I'd probably be absolutely raving about it if I didn't have so much love for the 'Hard Rock Live' show. But two great shows to provoke debate between fans about which is better can't be bad from a band that were all but dead and buried only a few years back!